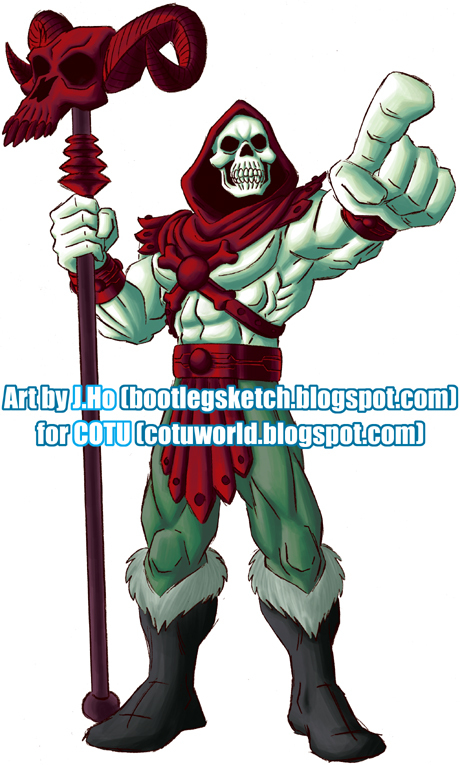 Yet another re-design challenge at the He-Man.org fan-art forums–my post is here and the original thread is here. The voting thread is here–I placed second. This one came together pretty quickly–for whatever reason, I was able to quickly pick colors that I was satisfied with, which I usually find difficult and time-consuming. 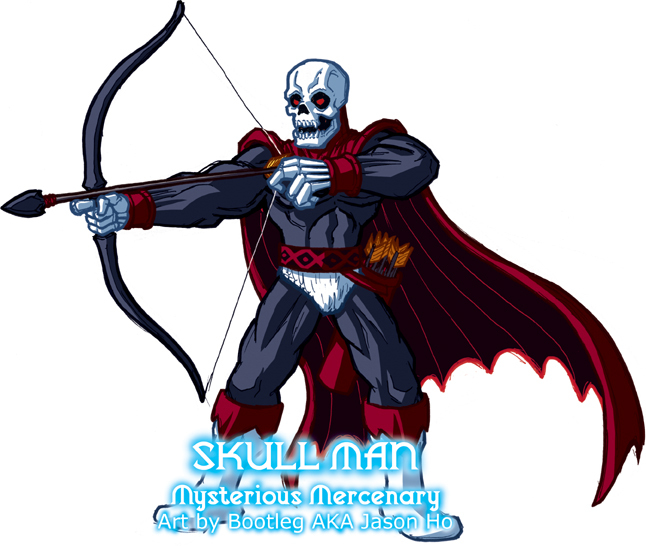 The key for me was adding more cold colors to accompany the white face and turquoise brow of the original color scheme. His chest and shoulder armor were modified to resemble the Aracnos symbol, and the studded arm bracers are taken from the official illustration of Felinor. I added the nose, the tail, the scaley feet and hands, and the cat’s eye motif (A lot of the other fan-interpretations of Felinor include a cat’s eye motif as well). The cape is my addition too–inspired by the hood-like collar in the original illustration. Despite the wisdom of the Incredibles, I just think everyone is cooler with a cape. And as a nod to Felinor’s allegiance to the Aracnos, his cape has eight points, just as a spider has eight legs. FELINOR is fiercely loyal to Carnivor, ruthless leader of the Aracnos faction. 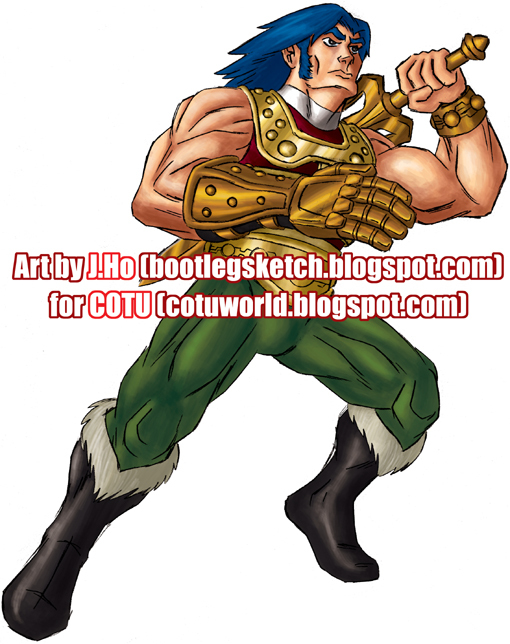 His golden sword was created by a master sword-maker, in a mortal attempt to mimic the divinely forged perfection of He-Man’s power sword. The sword-maker’s intentions were not sinister, but Felinor cast a spell to corrupt the blade, and the cursed sword now shares Felinor’s hunger for blood. To further bolster his strength, Felinor encrusted his power sword’s hilt with an enchanted gem. This gem is another counterfeit–copied from an artifact from the nearby planet Thundera (the gem on his breastplate is simply decorative). In spite of all this, Felinor’s power sword still does not match that of He-Man or She-Ra’s true power swords. It is rumored that the mysterious sword-maker escaped and disappeared, and was even able to forge more power-sword imitations. the existence of these swords has not been confirmed. I coined Felinor’s title of “Evil Nocturnal Champion” myself, but in light of the profile I just whipped up, I wonder if “Evil Copy Cat” would have been more appropriate?